'Thousands of bodies everywhere. In fact, just one body, a single immense ramified mass of flesh, all sexes merged. A single, shameless, expanded human polyp, a single organism, in which all collude like the sperm in seminal fluid.... [a] human hyperorganism... A kind of single being, living the same life, with the same fluids coursing through them, aquiver with the same passions' (Baudrillard, Fragments: Cool Memories III). 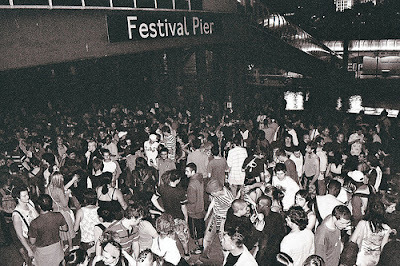 Photo of Reclaim the Beach party, London, 2006, by Georgina at Flicker. Baudrillard's comment was actually about Copacabana beach in Brazil.